When I told my boys that we had received the Hotel Chocolat Festive Wreath to do a review on, to say they were overjoyed is an understatement, especially Lewis, being a massive chocolate fan he loves trying out all sorts of new and wonderful chocolate treats, and Hotel Chocolat none of us had tried before. The Festive Wreath arrived in a beautifully displayed box, and inside that box was hidden amongst the packaging a neatly packed and well-presented chocolate Festive Wreath. It looked divine! My first thoughts were this would be an excellent Christmas present for anyone (or even as a treat for yourself). At first I really did not want to break the wreath, I would have quite happily put it on display, however my willpower wouldn't hold up, and having Lewis asking me several times "can we try it now Mum" we just had to open it and taste it. 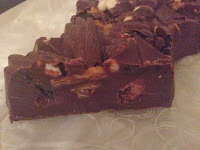 My son, Lewis is a massive fan of chocolate, and we have both been enjoying a chunk together each day. Made with nibbly cookies, hand cut caramelised almond Florentines, and with at least 50% cocoa solids; so it is slightly richer than milk chocolate, however it also has a mix of 20% milk solids, which does balance the flavour out nicely. 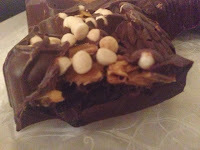 The chocolate has a very unique taste, which I surprisingly really liked (I normally only like plain milk chocolate) and so did the boys. Available from the Hotel Chocolat's Christmas range, it would be a lovely gift, it is unique, special, very well presented and a generous size - Who is not going to fall in love with this when they see it? The Wreath costs £21 weighing 15.9oz, or there is also a small wreath available and that one costs £7.50 weighing 3.5oz. They offer next day delivery if you order before 6pm, or if you are lucky you may live near one of there stores, which are based all over the UK. Verdict, it tasted wholesome, slightly richer than milk chocolate, full of different textures and full of glorious flavours. Yummy. Disclaimer: I was sent the Festive Wreath free of charge for the purpose of the review.